Brian Kershisnik could be called the Mormon Norman Rockwell – if Rockwell had painted like Chagall and Mormons were still called Mormons – they aren’t supposed to be, I know, but can’t for the life of me recall what replaces the term so recently declared out of favor by the LDS Church First Presidency. 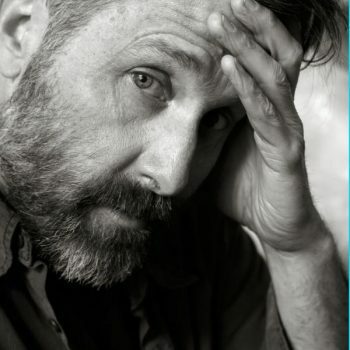 The talented, witty and beloved Utah artist paints a variety of souls and situations with humor and/or pathos but nearly always adds a vital grain of salt to any drama he portrays. My own fascination with Kershisnik’s work began in the mid-1980s at the now-closed Dolores Chase Fine Art located in downtown Salt Lake City. Even then he had a unique style — one that has remained consistently beguiling. I have continued to value his increasing depth — as well as his often-daring whimsy — along with a continually growing technical skill. One never had to be a believer, in anything at all, to appreciate this artist’s message. In an introductory essay to Looking for Something: Selected Paintings, the first published collection of Kershisnik’s work in 15 years, the artist starts off with the tantalizing words, “I make art because” – and naturally you stop right there. Artists sometimes can talk about why they paint what they paint, but answering simply why they paint is more revealing than they usually choose to be (or perhaps can be) about themselves. Kershisnik, however, does not disappoint. “I make art because I am searching for things,” he writes, a statement that appeared on his blog some time back. But here he continues: “This looking teaches me, and teases thinking out of me, and precipitates conversation between my internal and external worlds in ways that do me a great deal of good. “My job is to paint, and I believe to paint very well. For me, that means I must utilize, manipulate, and combine physical materials with metaphysical materials in ways that are significant and vital.” (Can’t you just hear William Blake? “I must create a system, or be enslaved by another man’s. I will not reason and compare: my business is to create.”) The essay provides profitable insight into the intention of this artist as he paints. An extensive essay, “Gravity Lessons,” by art critic and writer Geoff Wichert (whose apt words so often grace the pages of 15 Bytes) offers several pages of worthwhile perspective on Kershisnik, his life and work. One of several sons of a petroleum geologist, the artist grew up in a variety of places overseas, the last being Islamabad, Pakistan, where his high school education ended in an early diploma due to an emergency evacuation. He ended up at the U of U where he studied architecture and ceramics, then served an LDS mission in Northern Europe. While studying ceramics at BYU on his return, he met Joe and Lee Udall Bennion – she put one of her paintbrushes in his hand and that, Wichert tells us, was Kersishnik’s bridge between his student days and becoming the artist he is today. We learn more esoteric things, too: that if events in a painting “appear perplexing it may be because [Kersishnik] often prefers to paint the moment just before or just after something happens.” That is one of many revelations from Wichert the critic that proves extremely helpful in viewing paintings in the book, but I should let you read the rest. The artist’s accomplished wife, Faith Kershisnik, a systems therapist before becoming artist, illustrator, writer and business partner with her husband, contributes the third and final essay in the book, “The Hard Part.” She describes, in her first published piece of writing, the dream of an artist, of her artist, of how it feels when the show is over – or more to the point, has just opened. It’s lovely. This is as much a storybook as an art book – every picture tells one, of course, and they combine easily into parables each time you thumb through, as you often will. You might prefer that this volume be larger: it’s about 9 x 10 1/2 inches, but it settles nicely into one’s lap and the pages turn readily. The book was printed in China for Latitude Press and the more than 200 reproductions are superb – the colors deep and rich and resonant. Can’t say as much for the text — it may be the typeface, the grayscale, or the spacing, but it doesn’t quite make for comfortable reading. The classy attached black ribbon bookmark atones for any perceived sins, however. Kershisnik will be at King’s English Bookshop for a discussion and signing on Saturday, Oct. 13, at 7 p.m. Books are available there now for purchase or pre-signing if you hate standing in lines. The artist is represented by David Ericson Fine Art in Salt Lake City, where you’ll find a selection of new works through October 18; Meyer Gallery in Park City; and New Vision in Orem and has a vast online presence. 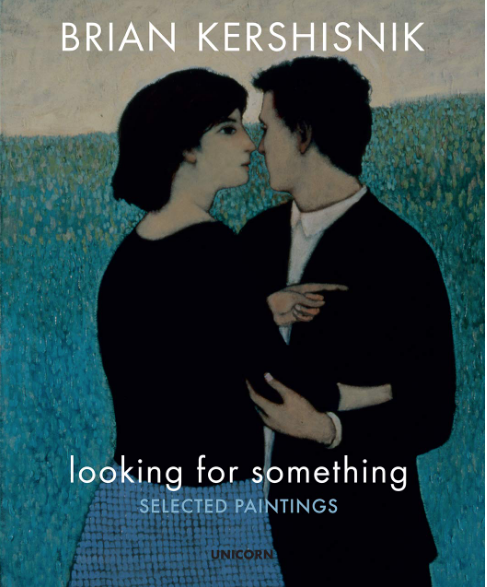 What a transfixing cover painting (“Lovers: Looking for Something”); this, and Ann Poore’s review, sent me to The King’s English Bookstore to find a copy of this book by Unicorn Press and read Wichert’s review of Kershisnik and his work within (“Gravity Lessons”). Also, to see countless Kershisnik paintings I’d not seen before. Also to read (as Poore points out) an unusual and fine piece written by the wife of the artist. Throughout—the sense that Kershisnik’s paintings are somewhat like a perpetual-motion machine; he finds in his paintings aligned but contradictory balances and energies that keep them humming, clicking, in our heads: the strangely restful-looking paintings that, wonderfully, never rest. Insightful and graceful observation on the sensation one gets in response to Kershishnik’s paintings. I’ve been thinking about it a while now.